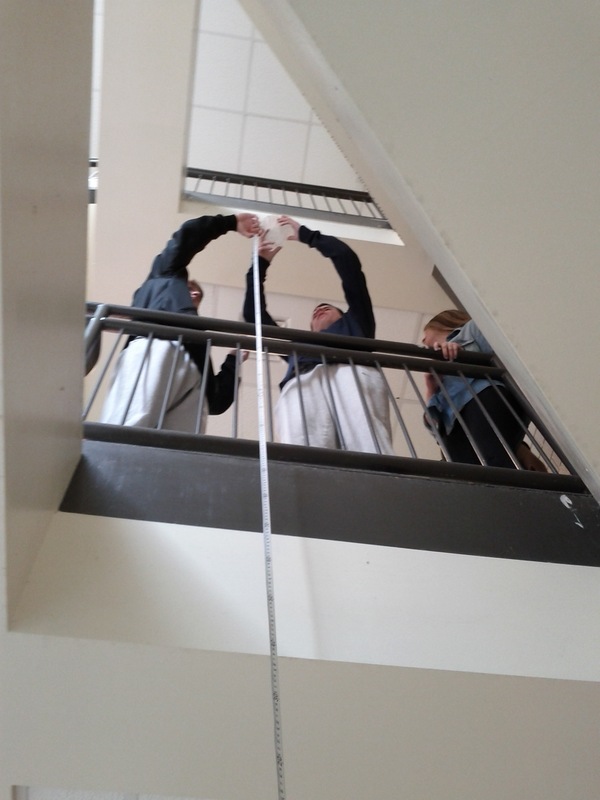 82 We are nearly finished analyzing the data from the Newton’s 2nd Law lab. This is the first time this year that the conceptual students have had to deal with an inverse proportion, so that is new. The shapes of the graphs look nice, but we haven’t checked to see how the slope values match up with what they should be. We are not quite there yet. 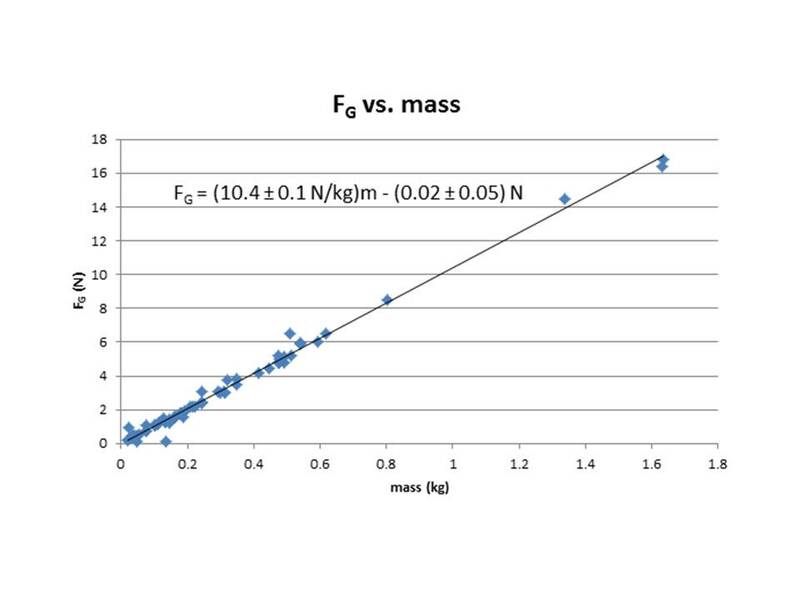 30 The conceptual students are finding the relationship between weight and mass. This is two classes’ worth of data, so 12 groups, each with 6 objects to measure mass using a triple-beam balance and weight using spring scales. I made this graph, but my students had to graph by hand and did not have to determine uncertainties in the slope or y-intercept. I did that for my own pleasure. Today was a strange day because we administered PSAT/NMSQT tests to all the 10th and 11th graders, then we had periods 4-8. Tomorrow we have a half-day followed by inservice, and will meet for periods 1-4. During 4th period, I have hall duty. I don’t mind having hall duty twice for each of my other classes meeting once, since this means I don’t have one class getting absurdly ahead of the others. However, due to this wacky schedule, I am not assessing my conceptual classes this week. 25 One thing I have noticed is that the Modeling Instruction materials for physics do not have a lot of practice materials in them. Practice is what helps you get better at things (it builds myelin layers around the circuits in your brain), so over the years I have made various practice materials for my students. 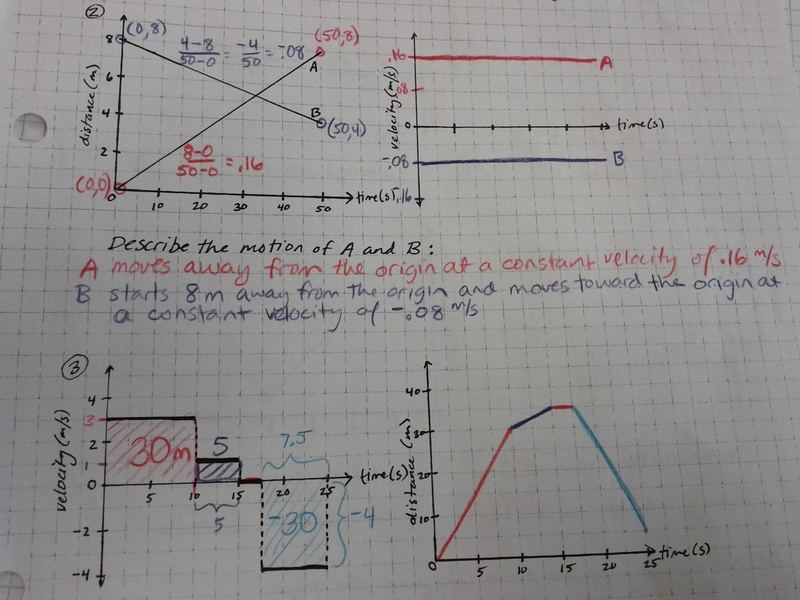 Today we were getting ready for tomorrow’s assessment of x vs. t and v vs. t graphs with my conceptual classes. So last night I made some practice problems. I drew them by hand on graph paper with a sharpie pen and a ruler, which was much more relaxing for me than trying to create them all on the computer. Doing it on the computer is easy enough with OmniGraphSketcher and Excel, but drawing these out by hand is very soothing for my brain. Soldering is like that too. I am perfectly happy to sit and solder for hours at a time. Anyway, we did not get to go over the answers in class, so I made a colorful answer sheet, scanned it, and put it on Moodle. I hope the different colors help the students get which parts are which. The photo above shows two of the six “problems” I gave the kids. What is the total distance? What is the total displacement? What is the average speed? 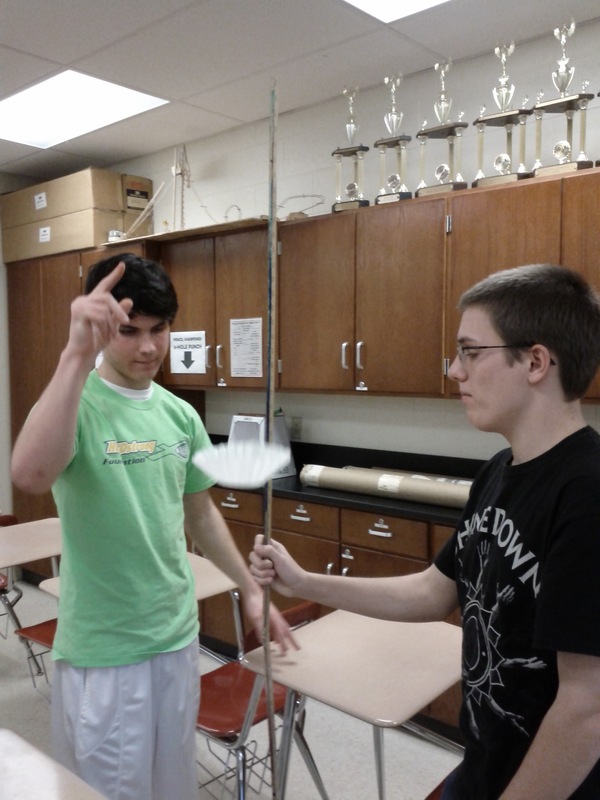 What is the average velocity? 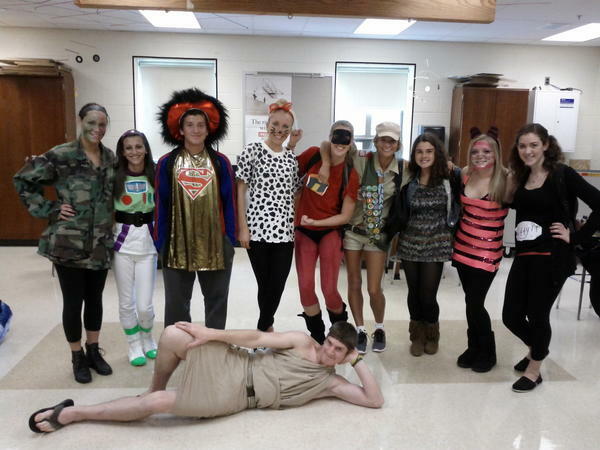 The two groups were awesome. They had good discussions. They asked each other questions. They explained things to each other. The video clip above isn’t the best discussion I heard, it’s just the one I got to with the video camera and which then had the best sound quality. Another group had even better discussion, with better participation among the group. Unfortunately, I could not make out what they were saying once I looked at the video. 21 This is today’s assessment. 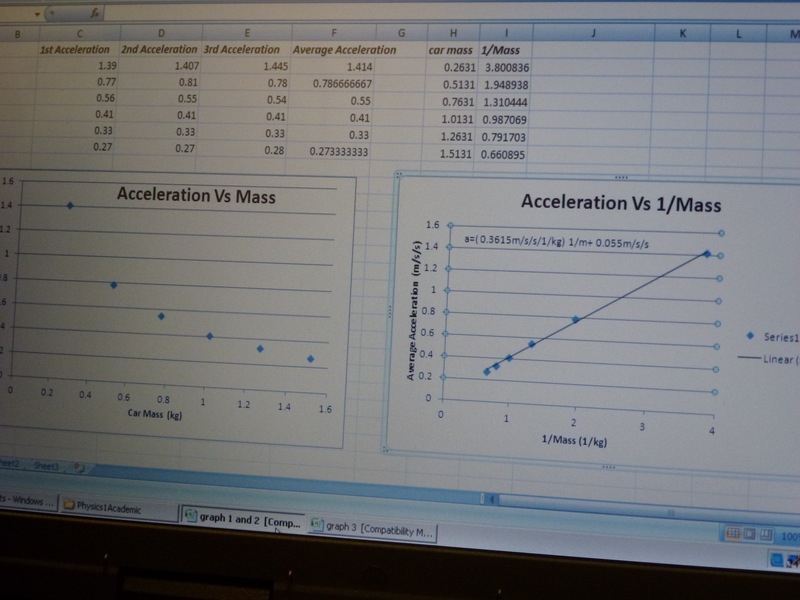 You may recognize the graphs on page 1 from some of the mechanics Modeling Instruction materials available on the AMTA website. But I changed the question to fit my intent. This student did a great job. Some students are still completely clueless. So we have some more work to do. I want to have an archive of practice problems for those kids who really need a lot of practice to get some things right. A lot of practice to build up enough myelin so that they can read a description of motion and make a position vs. time graph. If you look at the second page, I had a lot of kids who could draw the correct shape of the graph, and most of them even started the graph at the point (0s, 5m), but very few were able to put correct slopes in. So, more practice! 19 Today we started making the big connections (actually we did this yesterday with one class) between position vs. time graphs and velocity vs. time graphs. 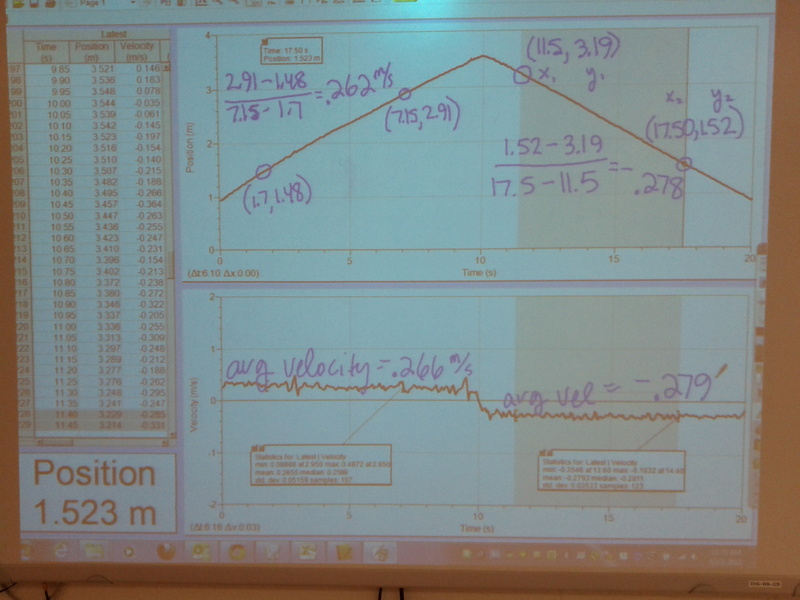 We got predictions for velocity vs. time graphs first, sharing them on the board at the front of the room, and then we used the motion detector to see which (if any) of the predictions were right. 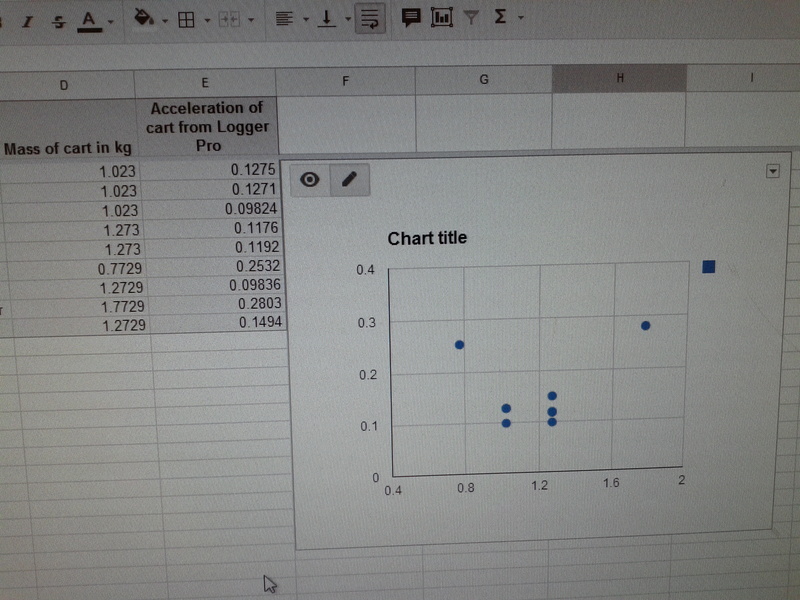 Then with this one, which was the last one, I used the tools in Logger Pro to get points on my position vs. time graph and students calculated the slopes. Then I used Logger Pro to get the average velocities from the velocity graph, and the values were pretty similar to the slopes. Being able to do this and annotate it without having to walk back and forth between the board and the computer is one actual good use of the Promethean ActivBoard in my classroom. Finally, we applied the slope = velocity to draw a variety of velocity vs time graphs for a variety of position vs. time graphs. Sometimes practice is a very good thing! Tomorrow it will be “Mistake Game” time with the velocity graphs and then we can move on to using graphs to answer questions!